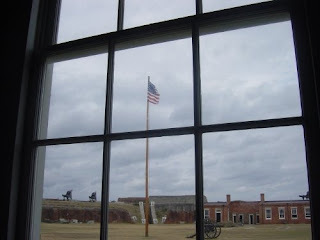 So, here we have a flag in the Fort Clinch visitor center. It does not say, but from its condition, I am guessing it is a reproduction that has been flown over the fort in modern times. 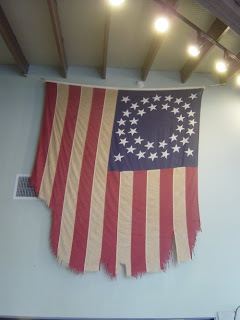 Here is the current flag, a reproduction of the US flag in use in 1864. This is actually the most popular design of the 36 star flag, and several other variations existed. 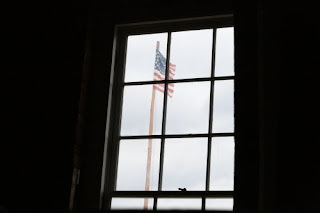 This is my wife's version of the flag-in-the-window shot. 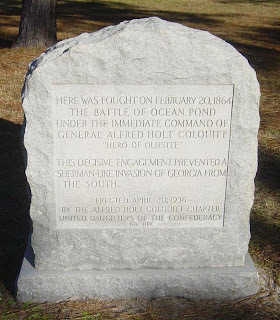 The Union campaign that climaxed in the Battle of Olustee (or Ocean Pond) began in February 1864, when troops commanded by General Truman A. Seymour embarked at Hilton Head, South Carolina. Their immediate objective was a fourth occupation of Jacksonville. 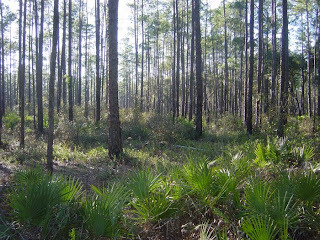 The force could then disrupt transportation links and deprive the Confederacy of food supplies from central Florida; capture cotton, turpentine and timber; gain black recruits for the Union army; and induce Unionists in east Florida to organize a loyal state government. 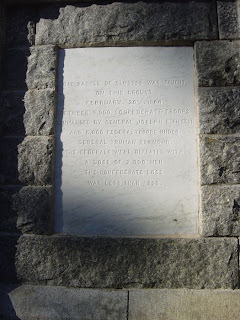 Seymour's expeditionary force landed at Jacksonville on Feb 7. Scouts and raiders moved west and met little opposition.Meanwhile, during the month of January, movement of the Federal fleet had been noted by the Confederate forces, and they began to prepare for an offensive. 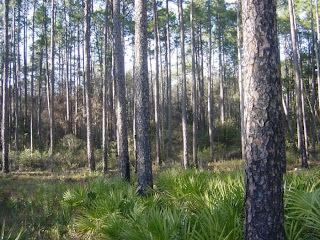 The defense of Florida was placed in the hands of Brig. General Joseph Finegan and Brig. General Alfred Colquitt. 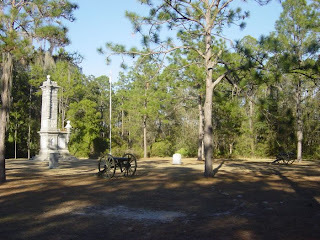 Once it was apparent the Union forces were moving westward in Florida, Finegan began searching for the Confederate army's best defendable position.Finegan found that position at Olustee. 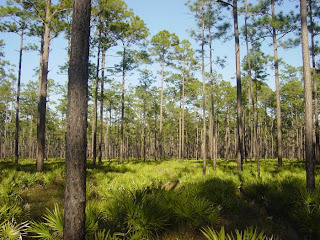 With a lake called Ocean Pond on his left, a nearly impassable swamp on his right and only a narrow passage between, he called for troops to help defend Florida. Colquitt answered that call, bringing veteran troops from Savannah, Georgia. On Feb 20, the Union force of 5,500 men and 16 cannon marched westward from Barber's Plantation, near modern day Macclenny. Their plan was to defeat the Confederates 32 miles away, near Lake City, and then cut off the railroad there. 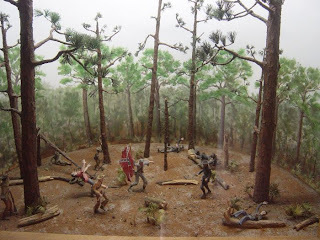 But by this time, the Confederate forces almost equaled the Union opposing army in number, and Finegan sent skirmishers to draw the Union forces to Olustee. The Union army drove the Confederate cavalry back several miles, but resistance kept growing stronger. H.W.B. Athens wrote "At 8 o' clock in the morning on the 20th instant we were informed that the Yankees were advancing. A part of the brigade was immediately ordered to some rifle pits hastily constrcuted near at hand, the remainder forming line of battle in open field. In this position we patiently waited the coming of the foe for an hour, when our General, who is a fair man, concluded to meet halfway." The opposing armies made contact that afternoon and the Confederate line was formed, infantry in the center with cavalry on each flank. 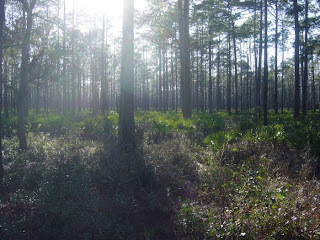 The battle was joined on the floor of a forest of virgin pines, free of underbrush. 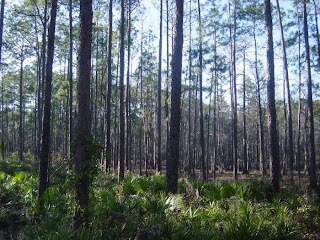 Men fought in the open forest; neither force constructed earthworks. The Union army was cauhgt between two swamps, one preventing their advance, and one hindering a retreat. Initially, neither side expected the battle here to amount to much. Around 2 PM, the battle intensified as the 7th Connecticut opened up heavy fire with their Spencer repeating rifles. This caught the 64th Georgia off guard and killed all of their field officers. Colonel Barrow of the 64th had told his men "I am sure that we are in the right, and that God is on our side. Follow me today, my men, and I will lead you to the enemy. 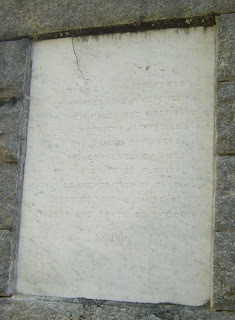 Remember, that the honor of Georgia rests with you." Soon after saying these words, Col Barrow was shot through the heart by a Union bullet and killed instantly. 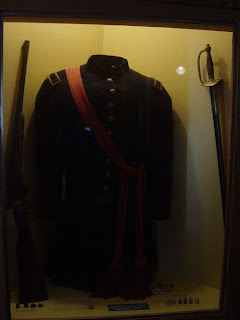 The 7th Connecticut advanced quickly, and soon found themselves ahead of the rest of the army, and in a deadly crossfire. The Union advance was finally halted when they ran low on ammunition and witdrew several hundred yards. Milton M. Woodford of the 7th CT wrote home "As we advanced, the enemy retired, keeping just in sight. Whenever we could get near enough to atnd any chance of doing execution we would blaze away at them and they returned the fire in a way that showed that they were good marksmen, for their shots came plenty near enough, although none of us were hit." By 3 Pm, the 7th New Hampshire deployed on the Union right flank, battling heavy fire from the Confederates. The regiment had earlier been ordered to exchange their Spencer repeating rifles for old, defective muskets, many of which did not even fire. Colonel Hawley, leading the 7th new Hampshire, either gave a wrong command or his command was misunderstood, causing the confused 7th to scatter to the rear. The 8th US Colored troops with no battle experience and little traing were deployed on the Union left flank. They had less than one month's service and had never practiced firing their weapons. They were severely mauled at a railroad crossing east of Olustee. Of the 375 men in this troop, 310 were killed or wounded. 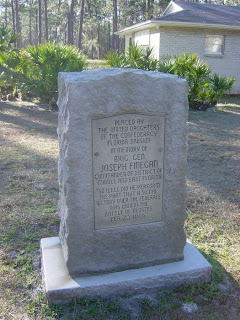 The 8th US Regimental Surgeon wrote "Here they stood for two hours... under one of the most terrible fires I ever witnessed, and here on the field of Olustee, was decided whether the colored man had the courage to stand without shelter, and run the dangers of the battlefield, and when I tell you that they stand with a fire in frint, on their flank without flinching, I have no doubt as to the center of every man who has gratitude for the defenders of his country, white or black." Around this time, Colonel Harrison arrived with Confederate reinforcements. The area recently vacated by the 7th New Hampshire now came under concentrated fire. The train also had a large cannon mounted on a flatcar which shot a lare shell every five minutes with devastating effects. 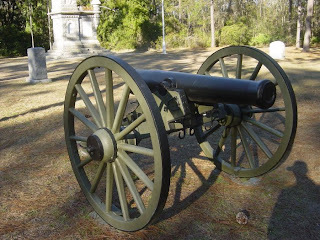 By now the Union had five cannon captured and almost all others rendered useless. James H. Clark remarked "the horses and men were nearly all killed or wounded, and it was the greatest slaughter among artillery known in the history of the war." By now the Union felt the day was lost, but the 54th Massachusetts and 1st North Carolina US Colored advanced, staggering the enemy. By 5 Pm the fire slackened on both sides as soldiers ran out of ammunition. The men searched the pockets of their fallen comrades, desperate for more ammunition. New supplies arrived for the Confederates and the entire line moved forward, led by the 27th Georgia. Colquitt's brigade gradually advanced until they were nearly on the enemy's left flank. The Yankees broke and fled, and the Rebels knew they had won. "Grape and canister swept by with hideous music, and shell after shell tore through our ranks and burst amid heaps of our wounded heroes. The 115th New York swept forward in the face of a galling fire, through reeds higher than our heads, over logs and fences, until the hateful columns of Southern grey were plainly visible.After three hours of fighting, every regiment excepting the 115th New York had been compelled to leave the field. Our boys occupied precisely the same position which they did at the opening of the battle. They stood battling over the bodies of their fallen comrades...At last the shades of night covered the field of blood, and we were then ordered to the rear. After giving three ringing cheers of defiance to the rebels, the regiment slowly and sadly dragged themselves away. Over one half were killed and wounded, and the remainder were black with powder and the smoke of battle, and could hardly move." -James H.Clark: "The Iron Hearted Regiment." 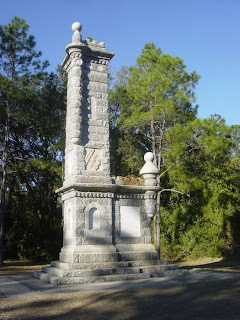 Union soldiers remained in Jacksonville until the end of the war and occupied several coastal towns and various places along the St Johns River. They carried out frequent operations against Confederate forces defending east Florida but did not venture out in significant force again. A small onsite museum has several artifacts, but does not say if they are originals or reproductions. 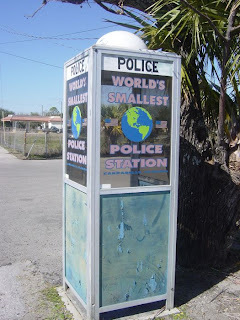 This is the World's Smallest Police Station, in downtown Carrabelle, FL. 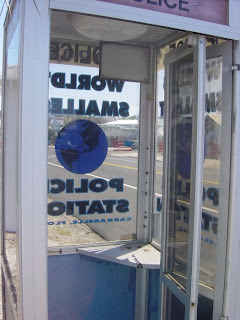 A few stories abound about how it came to be, but here is what is known: The Polices had a phone bolted to a nearby building, but its use exposed them to the elements, and supposedly it was used by people for illegal calls. So in 1963 when the phone company decided to retire a phone booth, the Police took it to put their phone inside. The illegal calls continued, however, and vandalism plagued the tiny station, so eventually the phone was removed. But the reputation as a Police Station lived on. Now it is an empty booth, still with the Smallest Police Station label. Supposedly, this is a reproduction and the original is on display somewhere else. I love local lore, never can get one straight story. This marker is in a rest area just east of the Crooked River Lighthouse. 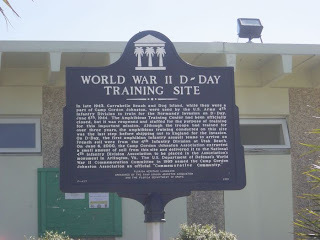 In late 1943, Carrabelle Beach and Dog Island, while they were a part of Camp Gordon Johnston, were used by the US Army 4th Infantry Division to train for the Normandy Invasion on D-Day, June 6th, 1944. The Amphibious Training Center had been officially closed, but it was reopened and staffed for the purpose of training for this important mission. Although the troops had trained for over three years, the amphibious training conducted on this site was the last step before shipping out to England for the invasion. On D-Day, the first amphibian infantry assault teams to arrive on French soil were from the 4th Infantry Division at Utah Beach. On June 6, 2000, the Camp Gordon Johnston Association extracted a small amount of soil from this site and delivered it to the National 4th Infantry Division Association to be placed in the Association's monument in Arlington, VA. The US Department of Defense's World War II Commemoration Committee in 1995 named the Camp Gordon Johnston Association an official "Commemorative Community." 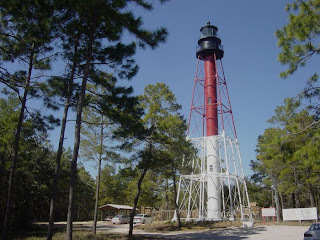 The Crooked River Lighthouse, just west of Carabelle, Florida, has seen many mariners safely home for the 100 years it was lit and used. It was built in 1895 to replace one on Dog Island that was destroyed in a hurricane in 1873. Authorities decided it would be better to have a lighthouse on the secure mainland rther than the exposed Dog Island. After construction delays, the Crooked River Lighthouse, flanked by two identical keeper's houses was completed. The twin houses, one for the keeper and the other for the assistant keeper were sold in 1964 and moved from the site. A fire destroyed one of the houses and the other remains in private ownership. Electricity came to the lighthouse in 1933 and it became automated in 1952. The lens was built in 1894 by Henri LaPaute in Paris France. The lens currently is on display at the US Coast Guard District 8 headquarters in New Orleans. The lighthouse was decommissioned in 1995. In 1999, the lighthouse belonged to the US Coast Guard, but was inoperable and deemed surplus property. 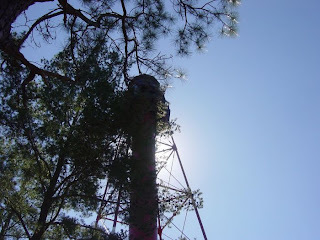 The Carrabelle Lighthouse Association was formed and in August 2001 the deed was transferred to the city of Carrabelle. 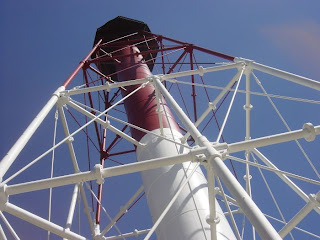 The following February, the CLA reached an agreement with the city to care for and restore the lighthouse. 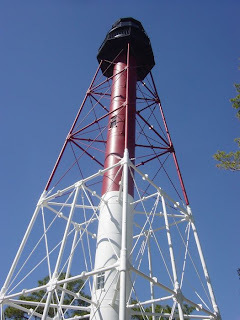 On December 8, 2007, with the restoration of the light complete, the park was opened to the public and the Coast Guard recommisioned the light as a private aid to navigation. 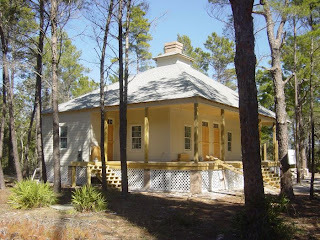 Currently the CLA and the city of Carrabelle are in the process of building a replica of the Light Keeper's house to be located in the park to serve as a museum. When completed the museum, lighthouse, and recreational conservation site will be open to the public. History and information from park brochure at the site. This is a playground that was not here in 2003. 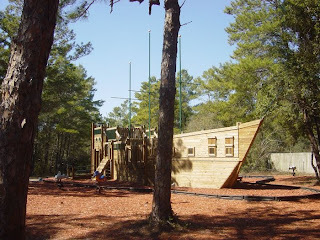 I sure wish I had a pirate ship when I was growing up!! A HISTORIC German U-boat which was cut into sections by a Widnes-based contractor and transported to its new home in Merseyside is now a key exhibit in a maritime museum. The U-534 is the centrepiece of a major exhibition centre being constructed by Appleton-based Whitfield and Brown at the Woodside Ferry Terminal. The U-boat was sunk in a Norwegian fjord by the crew of the “G” For George, a Liberator bomber of the RAF’s 547 Squadron. 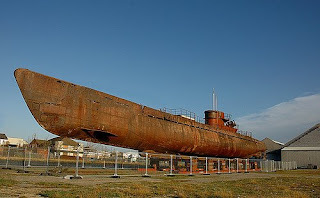 The vessel is believed to be the last U-boat to make an attempt to escape the Allies at the end of the war. Legend has it that the vessel contained a valuable cargo of contraband gold bullion, or possibly even a sacred relic known as the Spear of Destiny – said to be the spear that pierced Christ’s side. The sub was found to be carrying an enigma cypher machine. The Liberator dropped 10 depth charges on the sub during two attacks and one charge is said to have stuck to the upper part of its hull before exploding. The U-534 sank stern first and 49 of its crew survived. The Widnes contractor excavated a 60x20m “reception dock” into which the four sections of the historic vessel were placed. The Mersey Mammoth floating crane was used to transport the sub to its new home. A project spokesman said: “The sub U-534 was formerly the centrepiece of Wirral’s Historic Warships Museum until it closed two years ago. “It was bought for a nominal sum by Merseytravel after there were fears it could be sold for scrap. Despite this book's kid-like appearance, it is actually quite valuable, and I would have kept it if I had bought it, and not checked it out from the library. When it comes to the Seminole Wars, most books (which there are not many) focus on only one of the three wars, or a specific aspect, etc. Only two that I have found completely cover the entire conflict from start to finish. This is the good one. The other one was written and arranged in a very confusing manner that made the sequence of events hard to follow. This book is neither long, nor hard to read, but it covers all aspects of all three wars to satisfy any curious history buff. 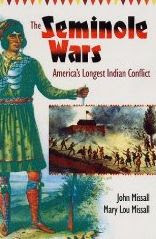 Anyone living in or near Florida should read this and I would recommend it to anyone else, also, as the Seminole Wars were THE major event in Florida of the 19th century and had a profound impact on the rest of the country as well. The book can be purchased on Amazon here. 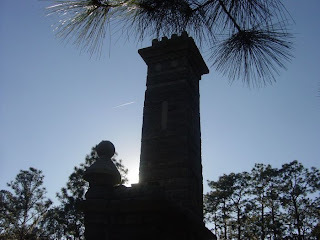 Also see the several Seminole War sites I have visited here.